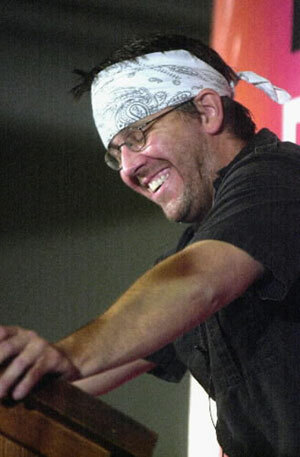 Very sad news this weekend about author David Foster Wallace, found dead in his home on Friday from an apparent suicide. He was only 46. While already a ‘game changing’ writer -someone who forever alters the literary landscape – I can’t help but wonder what else he might have produced in years to come. I’m quite sure that he could have been a cross-generational influence, much like Saul Bellow or Philip Roth – a writer who affects readers over the course of a long and prolific lifetime. Aside from his published works, well worth reading is his commencement address to Kenyon College in 2005. Here’s an excerpt, which seems in some ways eerily prophetic. I have never read Mr. Wallace’s books. Sadly told I never heard of him. Just now in the prime of my life…58 yrs young, I realize I have missed out on alot of reading. Having read so much information today on Mr. Wallace, I am looking forward to checking out his books from the library to read. I am sure that when I am able to afford the purchases of them I will make a collection of them. One of the things I am teaching my grandkids is the importance of reading everything. Not to waste their lives like me , only to now ,try and play catch-up. Thanks! I sent a comment already but neglected to check…both notifies…which I just did below. Thanks again.